The main objective of Prevision 7UP Baccarat is to correctly predict which of the two hands (Player or Banker) will have a point value closest to 9, with a slight deviation whereby the first card of the Player shall always have a fixed value of 7. There shall be two hands dealt, one of which shall be designated as the "Player" hand and the other as the "Banker" hand. While the first card of the "Player" hand always have a value of 7, three cards shall then be dealt with the first and third cards dealt representing the first and second cards of the "Banker" hand; and the second card dealt representing the second card of the "Player" hand. Any 10, Jack, Queen or King shall have a point value of zero. Where the total value of the cards in the hand is a number between zero and nine, the point total shall be that number; or where the total value of the cards in the hand is the number ten or a higher number, the point total shall be the last digit of the sum of the cards. For example, a hand of Jack, 4, and 9 has a point value of 3 (since 0 + 4 + 9 = 13). If the point total of the "Player" hand or the "Banker" hand after the initial four cards is 8 or 9, no further cards will be drawn. The resulting hand is called a "Natural" and the hand is over. 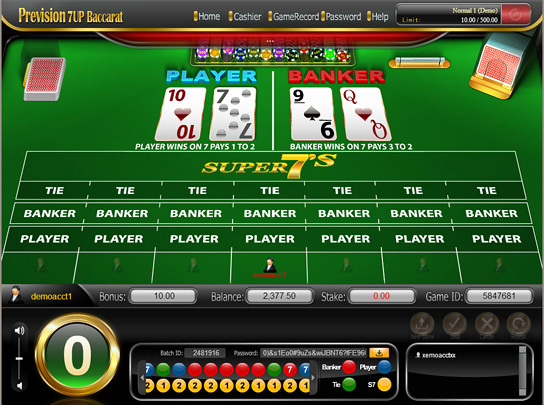 "Tie" means that both the "Player" hand and the "Banker" hand have the same point total at the end of a round of play, in this case all bets on Player or Banker pushes. If the Banker and Player scored 6 or 7, is considered Tie.